Antoine Fuqua's OLYMPUS HAS FALLEN is glorious trash and the true heir to the DIE HARD franchise. Instead of a tired reworking of the Bruce Willis underdog saves the day action blockbuster we get its transmutation into a hackneyed but convincingly tense thriller. The secret of its success? Like all pastiche, you have to play it with a completely straight face. And by casting actors of the calibre of Morgan Freeman, Melissa Leo and Angela Bassett that's what this movie does. In addition, with its high gloss tech package, the movie looks as convincing as it feels. In fact, I'd go so far as to say that the sequence in which the White House is taken by enemy agents is as convincing, gripping and terrifying as the plane malfunction sequence that opens FLIGHT. Perhaps the biggest surprise is, however, how well Gerard "This Is Spaaaaarta!" Butler does as the action hero. He's an actor whose personal life seems as feckless as his career choices - and this loserdom nicely carries over into perceptions of his character, Banning, a disgraced and guilt-ridden former Secret Service agent who manages to get inside the White House during the raid and leads a single-handed fight back against the North Koreans. So what's it all about Alfie? In the prologue, we see Secret Service agent Banning (Butler) involved in the tragic death of the First Lady (Ashley Judd), leaving her picture perfect husband, President Asher a widower and their cute little son Connor motherless. As we move into the main body of the film, we see the White House come under aerial and ground assault from North Korean terrorists, and the President and his key staff (Leo, Freeman, Bassett etc) quickly moved into the underground bunker. Crucially, the President being a clean-cut, all-American, wonderful guy, he chooses to take the South Korean premier with him, allowing the treacherous Kang (Rick Yune - THE MAN WITH THE IRON FIST) to penetrate the bunker too. The only good news is that Banning, since demoted, has made his way inside the White House and makes contact with his former boss (Bassett) allowing all kinds of heroic derring do and kiddie rescuing. You can predict how the plot's going to unfold from the trailer. There's nothing new here but the familiar story is so well-done, so enjoyable to watch, so comforting in its predictability that you can't help but have a good time. Gerard Butler may well have resuscitated his ailing career, and director Antoine Fuqua certainly makes his most accomplished film since TRAINING DAY, even if it's far less radical in its content. 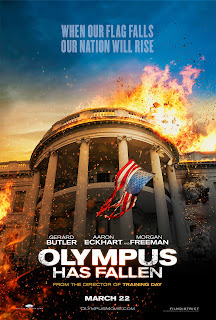 OLYMPUS HAS FALLEN is on release in the USA, France, Bahrain, Bosnia and Herzegovina, Greece, Hong Kong, Indonesia, Israel, Kuwait, Macedonia, Serbia, Canada, India, Pakistan, Taiwan, Iceland and Estonia. It opens on April 4th in Australia, the Czech Republic, Denmark, Hungary, Russia, Slovenia, Lithuania and Romania. It opens on April 12th in Singapore and Mexico; on April 18th in the UK, Belgium, Italy, New Zealand and Finland; on May 3rd in Sweden; on May 10th in the Netherlands and Norway; on May 16th in Argentina and on June 8th in Japan. OLYMPUS HAS FALLEN has a running time of 120 minutes and is rated R in the USA. Solid review Bina. The movie does do a good job with the action and if you go into the movie looking for a mindless popcorn flick, then this movie will have you leaving the theater satisfied. As did I, and that’s why I’m happy to recommend it to most people out there.